Place your order securely online or call us toll-free: 1-877-843-9278. This item includes free shipping, handling, and insurance! "This is almost a dream state, but it doesn't necessarily have to be a dream. I'm trying to evoke a feeling or an emotion, as opposed to a specific incident. No matter what I choose to do, I want it to be exciting and beautiful. I love to create and give myself new challenges." Both critics and collectors have been impressed with Thomas Blackshear's ability to capture a wide range of subjects with power, elegance, and integrity. With his own vision, he continues the grand tradition of such masters of 20th century narrative realism as N.C. Wyeth and Howard Pyle. In Swan Song, Blackshear's first Greenwich Workshop limited edition print, a strong Native American figure faces the sunset. In the nobility of his bearing, he symbolizes the pride of his people's history and traditions - a history that has changed forever with the coming of European settlers. 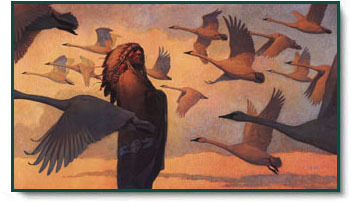 "I titled this Swan Song," explains Blackshear, "because it symbolizes the end of a way of life on the Great Plains." Blackshear takes his symbolism one step further by giving the swans of this song visible form. He uses their flight to represent feelings of hope and freedom that the Plains Indians' fate could not destroy." I wanted to do something with a Western theme, but with a different slant," Blackshear explains, "...something fantastic and beautiful. 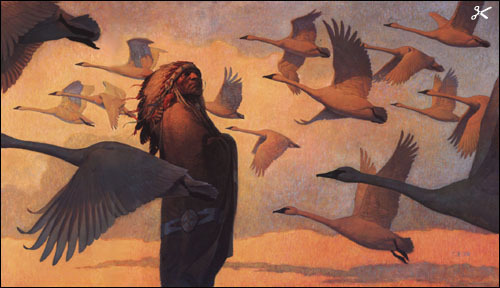 I made the swans and Indian darker than the sky," Blackshear says. "That way you notice the pattern they make against the sky, instead of seeing the light reflecting on them. I wanted to keep it exciting and beautiful, but still with a feeling of silhoutte." Thomas Blackshear's evocative Swan Song, an allegory for the end of an American era, is his first fine art print and celebrates his joining the Greenwich Workshop family of artists. Swansong copyright© 1994 by Thomas Blackshear II.